I am always looking for new and exciting ways to eat fish. It has turned out that I’ve made at least one new seafood dish every week for the last month. We love seafood so much and now that the spring is coming, I find myself craving it more and more. If only we lived in an area where fresh seafood was accessible. Pittsburgh… that is not you. I really don’t discriminate when it comes to seafood. Okay, well I have a hard time actually eating the tentacles when it comes to calamari, but a good bit of breading always helps. When it comes to salmon, I love it two ways: grilled and broiled. When broiled, it develops a crispy, crunchy crust that I absolutely adore. You just can’t beat it! It’s my go-to way for preparing salmon. Especially because I am afraid of the grill. Perhaps this summer I will set a goal to get more comfortable with the grill? Girl meets grill. Then grill will meet bacon. When my mom made that romano crusted fish last week, she also baked some store-bought bourbon glazed salmon that left us all less than impressed. But I loved the sound of bourbon glazed salmon and was dead set on creating my own glaze this past weekend. I was thrilled with the results. Even Mr. How Sweet, who moaned and groaned and refused to try the glaze on it’s own, stating that he “doesn’t eat bourbon” absolutely loved the salmon. And I think that the glaze will be delicious on chicken and shrimp and maybe even… dare I say it? Vegetables. The recipe makes a good bit so you have leftovers – simply store it in the fridge and use for a glaze or dipping sauce later. And if you don’t like the taste of bourbon, don’t fear… it’s nothing like drinking the straight stuff. It’s sweet and a little bit tangy, somewhat reminiscent of a barbecue sauce. I could eat it with a spoon, but that shouldn’t surprise you. It compliments the salmon so perfectly that you can serve it as the main course, in a taco, in a salad (boo! ), on a bagel or in some sort of sandwich. The possibilities are endless! 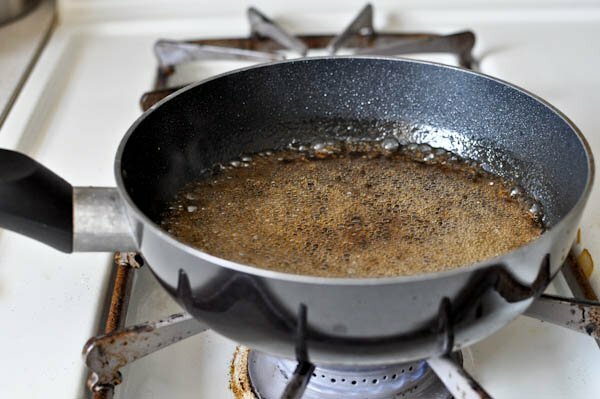 Combine the bourbon, sugar, mustard, garlic, honey, vinegar and worcestershire in a small saucepan and whisk. Heat over high heat and allow it to come to a boil. Reduce to a simmer and let simmer for 8-10 minutes, or until mixture reduces by about half. Pour mixture in a bowl and let sit at room temperature while the salmon cooks. The glaze will thicken a bit at this time. Preheat the broiler in your oven. Make sure the salmon is dry and season it with the coarse salt and pepper on both sides. Lay it on a non-stick baking sheet. Broil for about 5-6 minutes on each side, until the top develops a crispy crust. If your salmon is very thick, you may need to go a little longer. Remove the salmon from the oven and brush it with the bourbon glaze. Add as much or as little as you would like. Feel free to use it as a dipping sauce too. The glaze can be stored in the fridge for a week or two – just allow it to come to room temperature (or slightly warm it) before using. Gorgeous photos, making me hungry! You are right – they are great! I’m dropping everything and making this tonight. End of story. We LOVED this! Seriously, my husband’s eyebrows shot straight up after his first bite. He said it rivals — maybe even outdoes — our favorite salmon recipe. Since we have fish at least once a week, I have a feeling we’ll be seeing more of this in our future! Yay! Thrilled you liked it! This literally made my mouth water – looks so good!! This is probably the stupidest question ever, but is it safe to give my preschooler? I’m assuming the alcohol cooks off, right? Not stupid at all Amy! I honestly don’t know much about how and when the alcohol cooks off, but I simmered mine for a good 10 minutes, so I’m assuming yes. While you can get a hint of a bourbon flavor in the glaze, it tastes nothing like alcohol. OMG YUM. Want. I have been craving salmon for the last few days…tonight is the night for it, methinks. One quick thing–I don’t live in Pittsburgh, but my boyfriend is from there and his family still lives there, so we go back constantly. I feel like it’s pretty easy and inexpensive to get fish there, particularly at the Strip! (at Wholeys, in particular). Am I just totally wrong??? Awww snap! That looks so good! I saw an orange glazed salmon earlier, and now this…I want salmon for dinner! That sounds so delicious! I’m definitely giving it a try. I love this recipe, and I don’t exactly love salmon! Will have to try it out soon! I think I need this recipe in my life! Seriously it looks amazing. 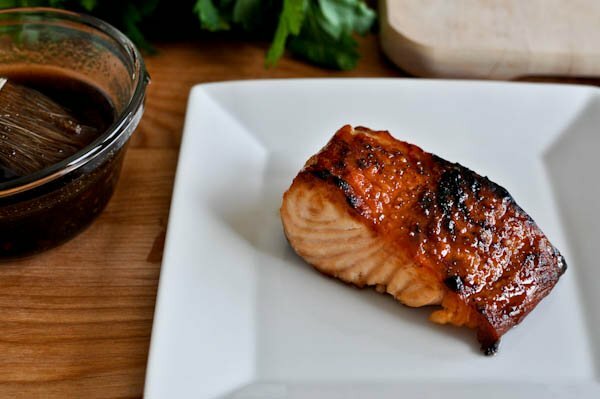 I loved salmon back in the day and love anything bourbon + brown sugar. Oh yum! Yumm!! This glaze might have to make it’s way onto some grilled veggies tonight! Well, doesn’t that just look perfect! Adding it to my must-make list. I love love love salmon. I love it grilled. I’ve never tried it broiled but will have to change that soon. The burbon glaze looks yummy i think i may have to give it a try. Jessica. Its 6:50am and I am drooling for this. I can’t wait to try this, but I have one question. My wife is allergic to both onion and garlic. Can you suggest something to substitute for the garlic in the recipe? ok. alcohol and brown sugar. i will be making salmon for the first time ever tonight now. thanks! my husband informed me we are out of bourbon — the travesty! do you think dark rum would work instead? he thinks it will but i’m skeptical. I think it would work! I love rum. i’m going for it then, thanks! Hi. I’m a stylist in LA and I’m totally obsessed with your blog. I’d love if you visited my new blog for multiple posts a day on all things fashion. I just moved to California after graduating back in south with a degree in visual merchandiser. In attempt to get my heel in the door, I’ve launched a site all about celebrity fashion and the trends that create it. Check out what Brad, Rachel Zoe’s former associate shared with me and find out my latest trend report. I’d love the support. I’m following you, I hope you’ll do the same. Thanks so much. And don’t forget to follow on Twitter for all the latest celebrity fashion news, from an LA stylist. Your food styling lately has been OUT.OF.THIS.WORLD. I love the perspective shots with lots of background. They add such dimension and visual interest. Truth: Someday I’d like to be you. Salmon is one of the few types of fish I will eat. I can almost taste this glaze. Yum! What type/ brand of bourbon did you use? Pingback: Eat right with color! | Move over, Celery! I realize this is an older post but can’t wait to make this! I’ve had bourbon chicken with shallots and it’s FAB, so I can only imagine how amazing this is since I love salmon! I made this last night for dinner…seriously the best salmon I have ever cooked. You could just drink that glaze on its own! YUM!! Thanks! :) I am trying your Crispy Shrimp Tacos on Friday. Every recipe I have tried on your blog has been fantastic (Clams Casino, Artichoke Bread, Bourbon Salmon)…I can’t wait to make more of your delicious food!!!! I love your blog and read it every day. So happy I found this blog! Can’t wait to try more recipes! I’m making this as we speak. EXCELLENT recipe. 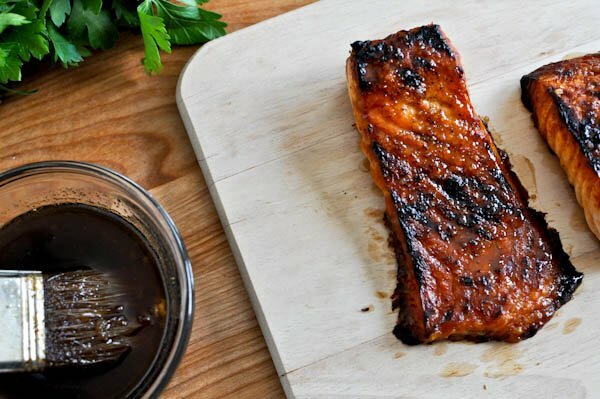 Also, just so you know…adding like 2/3 cup balsamic vinegar makes a totally different but still AMAZING glaze. Just simmer a bit longer to account for the added liquid. MMmmmm you should try it! Thank you SO much for this recipe. Penn Avenue Fish in the Strip is THE best place to get quality fish in Pittsburgh. Wholey’s is a great option too, but PAFC is tops for sure. They also have a great menu if you are looking for lunch while you are shopping. I’m a resident in the Strip so I’m spoiled; the ability to just pop over to PAFC and Penzey’s to pick up a few things is bliss! Hi! This looks amazing and I’m making it on Friday. What do you suggest to serve it with? I’m never sure what would be the best side with salmon! I made this tonight. FABULOUS. Thank you for such a wonderful recipe. I made this for dinner tonight it was so delicious!! I used a lot of substitutions because I didn’t have all ingredients on hand.. I used 1/3 Jack Daniels + 2/3 Canadian Club Rye + splash of vanilla instead of bourbon because I didn’t have any. Also soy sauce instead of worcestershire, and red wine vinegar instead of apple cider… anyways it is so delicious and flavourful on the salmon, and I can only imagine how good it is with the right ingredients LOL! Of course my boyfriend covered it in ketchup (seriously!) but I chose to not notice. And broiled salmon is awesome, I never knew how to cook it that measured up to grilling because grilled salmon is THE BEST!! But broiled its crispy too and juicy! Thanks for the fab recipe and cooking tip :) I’m excited for yummy salmon all year now, not just in the summer! I made this for my husband and a friend last night and we all gave it thumbs up! Delicious! This is a very good recipe! I live in Pensacola, Florida and we have all kinds of fresh seafood – this is great on sea scallops as well! Thanks!!! For the “ground mustard” are you referring to prepared ground mustard or ground mustard in spice form? I know I have the prepared stuff and mustard seeds as well as mustard powder, but not sure I have the ground mustard spice. Yet, another fablous recipe!!!!! The hubster loved it! Plan on using the extra glaze this week over chicken! So far everything I have made from your blog has been terrific!